While school enrolment rates have greatly improved over the last decade in Timor-Leste, the quality of education being provided remains poor. A recent survey conducted showed that at the end of grade one, 70% of children could not read a single word that was presented to them. This is perhaps not surprising, given that 71% of primary school teachers only have a high school education themselves, and many have had no formal training. 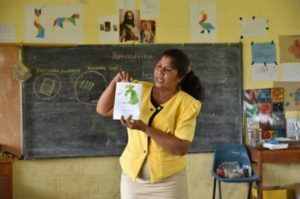 Improving the skills of teachers through innovative and ongoing training is one of the biggest investments a country can make to improve learning outcomes among children, and the Ministry of Education in Timor-Leste has cited this a priority as it rebuilds its fledging education system. In response to this great need, Mary MacKillop Today’s Tetun Literacy and Teacher Training Project provides ongoing training and support to pre-primary and primary teachers from remote areas, to equip them with the skills, knowledge and resources to effectively deliver the national curriculum to their students and ensure they receive quality education in the classroom. 5-day teacher training workshop, introducing teachers to topics such as classroom management, teaching methodology, creative classroom-set up and child protection. 2 day refresher trainings throughout the year to revise what was learnt and gradually introduce new topics. Regular in-class monitoring of teachers conducted by locally based field staff, followed by individual and group mentoring sessions. Provision of age-appropriate class materials including Mary MacKillop Today story-books that teachers can use when delivering the National Curriculum. Teachers are trained in how to best use these resources to develop their students literacy skills and encourage creativity and critical thinking. 150 teachers will enhance their teaching skills so they can more effectively deliver the national curriculum to their students. Over 6,000 students will benefit from receiving quality education in the classroom. Over 100,000 Tetum language storybooks will be distributed to teachers to use in the classroom. 25 Volunteer Teachers are supported with a training workshop and a monthly stipend. Contribute to improving long-term educational outcomes in participating communities. To watch a video about the Tetun Literacy & Teacher Training Program – click here. To request a copy of the full evaluation report, please email [email protected] and we will arrange for a copy to be sent to you. Act: Hold a World Literacy Day event at your school to educate students on the challenges facing children in Timor-Leste. Contact our Global Education Officer for details at [email protected] or contact (02) 8912 2777.